Comparing and Contrasting 'Billy Liar' and our own production. 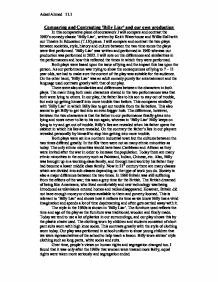 Comparing and Contrasting 'Billy Liar' and our own production In this comparative piece of coursework I will compare and contrast the 1960's comedy classic 'Billy Liar', written by Keith Waterhouse and Willis Hall with our Theatre In Education (T.I.E) piece. I will compare and contrast the two plays between societies, style, history and culture between the two time zones the plays were first performed. 'Billy Liar' was written and performed in 1960 whereas our production was performed in 2002. I will note on the differences and similarities in the performances and how this reflected the times in which they were performed. Both plays were based upon the issue of lying and the impact this has upon the person. As our performance was trying to show the consequences of lying to 7 - 11 year olds, we had to make sure the content of the play was suitable for the audience. ...read more. Billy's lies are revealed when his father opens the cabinet in which his lies are revealed. On the contrary the father's lies in our play are revealed personally by himself to stop him getting into more trouble. Both plays were set in a northern industrial town but the cultures between the two times differed greatly. In the 60s there were not as many ethnic minorities as today. The only ethnic minorities would have been Caribbean and African as they were invited after the war in order to increase the population. Today there are many ethnic minorities in the country such as Pakistani, Indian, Chinese, etc. Also, Billy was brought up in a working class family, and through hard work by his father they had become a lower middle class family. ...read more. The style in the 1960s is shown in 'Billy Liar'. The furniture used reflects the time and age of the play as the furniture was traditional, wooden and finely made. Today we tend to use a lot of plastics in our surroundings, and our play shows this by the plastic chairs used. The clothing worn by children and students consisted of short pant suits worn with high knee socks. This contrasts greatly with the style of clothing worn today. Our play was performed in school uniform to show young children that we were representatives of the school to help teach a lesson. Billy wore sixties' style clothing such as long pants, white socks and suits. Over time, people's views on human rights and segregation changed too. I found that it was only after the 1960s that women were treated more fairly, equal rights were taken more seriously and segregation ended. Adeel Ahmed 11.1 ...read more. There are a number of similarities and differences between Snow White and the play Iron Hans, which I will cover now. One of the more obvious similarities is that they are both fantasy fairy tales which both finish up with happy endings. radio station but in the film this scene comes much earlier than in the play script. "What's up- you know what's up? What have you done with that letter of your mother's?" says Geoffrey "What. What, what! Don't keep saying bloody 'what'. This play is known as a 'kitchen sink drama' as it is set in one family home and reflects what was happening in families and societies at the time it was written. The two main characters are Billy and Geoffrey. Shaken and Spied- The televisions series Alias. One of the first and most entertaining of the Bond movies was From Russia With Love. Unlike most of its predecessors, this Bond contained a well-written plot, realistic villains, and an attractive Sean Connery leading the reigns. In the first scene of film, the audience witnesses a Russian agent compromise James Bond with a lengthy and horrific strangulation. Also I would make it look neglected as unwanted just as Florence is. In act 3, I would be removed to show how she has passed on and it was only kept there for her no one else wanted it.